Upgrade your scuba diving credentials in one of the most sought after destinations for scuba diving in the world. During this 2-day course, you'll build upon the foundation laid during your Open Water Diver course and take on the challenge of 5 open water dives of 45-minutes each and 100-feet deep. You'll begin the course with the two mandatory dives of underwater navigation and deep diving. You can also choose from a course menu of specializations for the rest of your dives. Upon successful completion of the course, you'll have explored the colourful marine life of the Bali Sea and earned the certification of PADI Advanced Open Water Diver. NOTE: Only divers certified as a PADI/SSI Open Water Diver can book this scuba course in Bali. Due to high, underwater visibility of colourful fishes, the island of Bali ranks at the top of wish lists for most scuba divers. On this PADI Advanced Open Water Diver course in Bali, you'll travel to dive spots at Padang Bai and Tulamben. Dive spots near Padang Bai feature healthy corals populated by vibrant marine life including sea horses, angelfish, frogfish, white-tip reef sharks and sometimes, even the Mola Mola. Tulamben is a small, fishing village most famous among divers looking to do a wreck dive of a submerged US Army transport ship. • Get certified as a PADI Advanced Open Water Diver. • Undertake 5 dives as deep as 100-feet for 45 minutes each. • Upgrade your scuba diving skills in a small group with personalised attention. • Spend your evenings relaxing on the sandy beaches of Bali. Divers are required to adhere to instructions of the dive instructor during the Advanced Open Water Diver Course in Bali. Divers are requested to treat the local culture with respect and avoid littering, defacing property and monuments and causing general disturbance. Please allow 12 hours between the end of your diving session and your return flight to allow your body to recover. For cancellations made more than 7 days before departure of the Advanced Open Water Diver course in Bali: Full refund. For cancellations made 0-7 days before departure of the Advanced Open Water Diver course in Bali: No refund. Divers are required to have prior experience in scuba diving and swimming. Only divers certified as a PADI/SSI Open Water Diver can book this trip. A few days before the course begins, divers will be sent PADI e-learning material that can be used to get a head start before the course begins. Divers must agree to discontinue diving if respiratory congestion or a head cold or any other medical condition occurs before or during the dive. The tour operator reserves the right to change or cancel the itinerary of this Advanced Open Water Diver course in Bali due to bad weather conditions to ensure maximum safety of divers and staff. Divers will be required to bear any additional costs arising due to unforeseen circumstances such as bad weather, natural calamities etc. You'll be picked up from your hotel in Sanur by 07:00 hrs. At the dive centre, your training begins with a classroom session to refresh the theory and skills that you learnt in your Open Water Diver course. After a quick briefing session, you'll proceed to the dive spot at Padang Bai. Here, you'll suit up for two 45-minute dives into the Bali Sea that will take you as deep as 100-feet. Today, you'll complete the two mandatory dive specialities of underwater navigation and deep diving. Together with your diving instructor, you'll learn and experiment with several advanced techniques and skills of diving while exploring the tropical marine life on the Bali seafloor. Between the dives, you'll take some time to rest and have lunch on the boat. Return back to mainland by late afternoon. You can spend the rest of the day at leisure. Navigate the tropical and clear Bali Sea. You'll be picked up from your hotel in Sanur once again and driven to the dive centre. Your diving instructor will do a quick briefing session at the dive centre, after which you'll proceed to the dive spot at Tulamben. A short drive plus a boat ride later, you'll arrive at the dive spot. Today, you'll do 3 dives that are 45-minute long and 100-feet deep. You'll be offered a course menu of specializations that you can choose from for the three dives today. Between the three dives, you'll surface to have lunch and rest on the boat. But you'll spend your time underwater learning to dive responsibly while having fun at the same time. Return back to the dive centre, where you'll complete the paperwork for your certification. Your trip ends here. Spot exotic marine life and aquatic dwellers. No accommodation is provided throughout the trip. 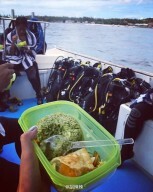 Today's meal package includes a packed lunch, snacks and water/soft drinks served on the boat between the two open water dives. No accommodation is provided throughout the trip. Today's meal package includes a packed lunch, snacks and water/soft drinks served on the boat between the open water dives. If you're staying at a hotel in Sanur, transfers between the dive centre and your hotel will be arranged by the tour operator in private vehicles. Please inform the operator of your hotel address after your booking is confirmed. If you're not staying at a hotel in Sanur, the dive centre is accessible via road. You can take local transport in Bali and travel to the dive centre. The tour operator will arrange for your transport to the start point of this scuba course in Bali.